In summer 2014, I acquired the remains of one light-duty utility trailer from my father, with the intention to clean it up and restore it, and modify it as needed to be a small boat trailer. I want to be able to carry one kayak, canoe, or small sailboat, along with gear. I decided I would also document this project in HTML and JPEG, hence this website. As I recall, my family purchased this trailer when I was in middle school and we lived in Kentwood, MI. It came as a DIY kit from Quality Farm and Fleet. Dad assembled the basic frame, wheels, and axle in our garage, and strung the wiring for the lights. I don't remember, but I hope I helped in some way, even if just handing him tools. Later, we bought some plywood and brass handles and hinges and built some locking cabinets attached to this trailer. I do remember helping with that: measuring, marking, holding it steady while dad ran the Skil saw, screwing on the hinges, and so on. The trailer came pre-painted black, and we prepped the cabinets with a gray sealing primer with plans to paint them too, but never did. That summer, Mom and Dad and I went on vacation all over northern Michigan, from the east end of the UP and the tip of the LP. We did Mackinaw Island, the Sault locks, Tahquamenon Falls, and more. We stayed in a motel once or twice, but mostly camped in tents at various parks along the route. The trailer served as our gear carrier. Our tents, sleeping bags, clothes, cooking and eating supplies, food, and toys all rode in the cabinets on the trailer while we rode in uncrowded comfort in Monm's GMC Jimmy. Our bicylcles rode in a rack on top of the cabinets. After the trip, the cabinets were removed and set aside in the garage. We had planned to re-use them on a future vacation but eventually they were recycled into other miscellaneous projects around the house. The trailer was used for the odd trip to and from the home improvement store, pulling loads too big for the truck, but not so big as to need to borrow a "real" trailer. When I went away to college, Mom and Dad moved about 25 miles, and the trailer was used for some trips to the new house, saving space aboard the massive moving truck they eventually had to rent. Correction! on the next paragraph: After posting, I was informed that the parade float was a different trailer that Dad made from scratch. Oh well, it's still a cool story, so I left it here. The next chapter of (some other) trailer's life came at the 1999 Allegan County Fair and Parade. Dad had become a serious toy tractor collector. 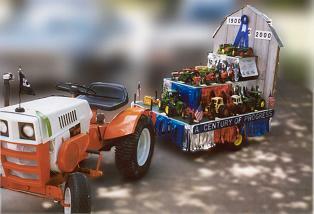 The parade theme was "A Century of Progress," and Dad's collection included models of farm machinery from the oldest to the newest. The trailer was given fresh paint, and had red, white, and blue mylar fringe wrapped around the base. Dad and his friends then built a three-tier scene backed by a simulated barn displaying about 20 of the show-pieces from his collection, held down by hidden wires. Transformed into a parade float, it was pulled behind a real-life antique garden tractor in the parade, and won best-of-theme. The prize was a hundred dollars, a blue ribbon, and a jar of jam. The float was quickly disassembled afterward. After this, I believe the poor trailer was parked in dad's back yard and basically abandoned for many years, maybe as many as ten. 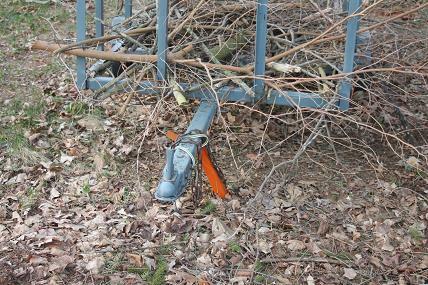 It was more or less under a pine tree that spat pitch on it from time to time. Birds perched above it and did what birds do when they perch above something. The tires rotted in place. The metal rusted. Dirt and debris collected on top of it. I'm sure there were grand plans, but by this time Dad had become mobility impaired, and could not have done much with it. I visited Dad in April 2014, and for some reason took a particular notice in the trailer, and saw its sorry state. 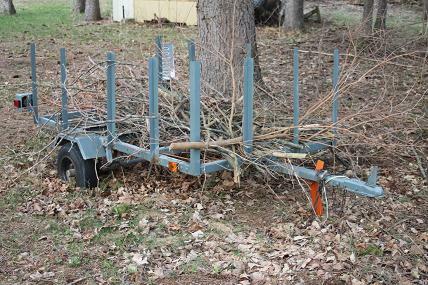 It had sunk axle-deep into the ground, and was being used basically as a brush pile holder, for limbs that had fallen around the yard. I decided right then to do something, but I could not act on it until later. I returned in September, and I found the trailer in the exact same condition. I wasn't even sure it would move. I had told Dad I was coming, and what I was going to do. I somewhat hoped he would prep it a little for me, but I was out of luck. On the other hand, as soon as I grabbed the tongue, I was able to pull it by hand and bring it to the driveway, there to spend my whole Labor Day weekend in, well, labor. Between Dad and myself, we removed the wheels to clean and re-pack the bearings. We took the wheels to an auto supply store and got all new tires installed. We checked out the wiring and found it working, but one set was reversed, which we corrected. We needed to re-position and re-mount one set of side clearance lights. We messed around with a plywood decking I will probably never use. The finishing touch was two bright orange reflective rods duct-taped at the back to help it be seen, both by the towing driver and anyone following. It was just enough to get it back to Milford, OH behind my Jeep. It so happened that my garage was crammed with tools and materials, as I was building and staging supplies for a major Boy Scout event, so the trailer was parked in my own yard for six weeks. But it was not under a tree!